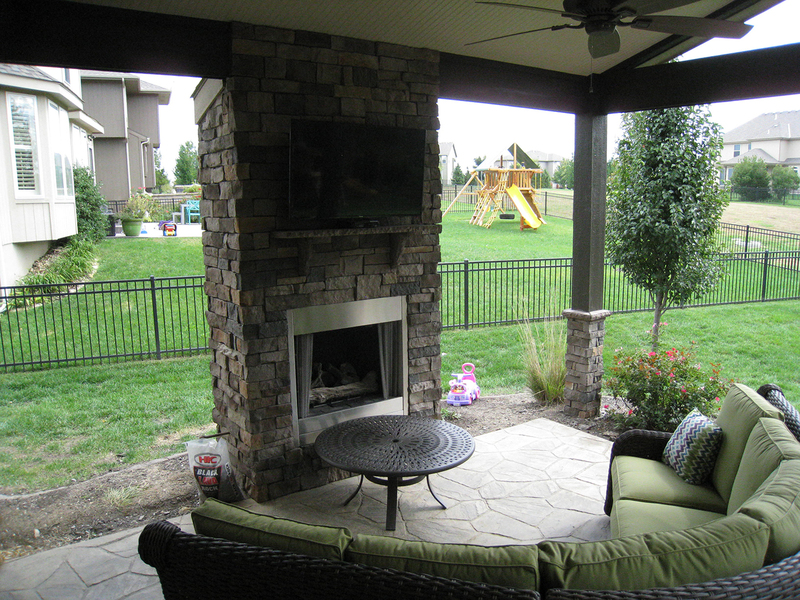 Are you thinking about an outdoor fireplace for your Kansas City area home? 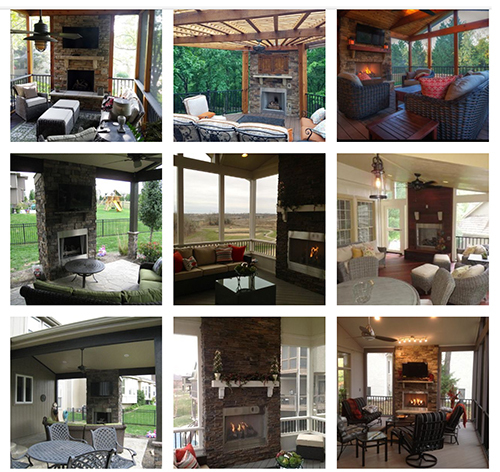 Outdoor fireplaces are tremendously popular here in the Kansas City area and for good reason. 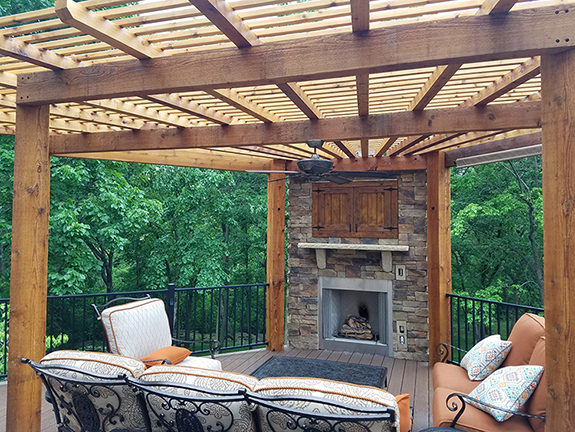 Adding a new deck or porch with an outdoor fireplace not only offers ambiance but it also ensures you can use your outdoor living space for more months throughout the year. An outdoor fireplace will be the focal element of your space and will add living opportunities. It invites conversation and creates a mood like no other amenity can. 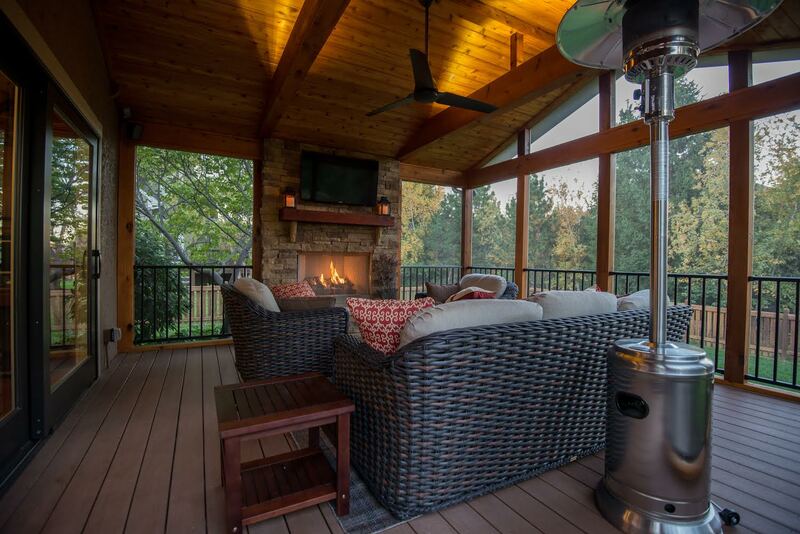 Should you have wood burning or a gas-powered outdoor fireplace? 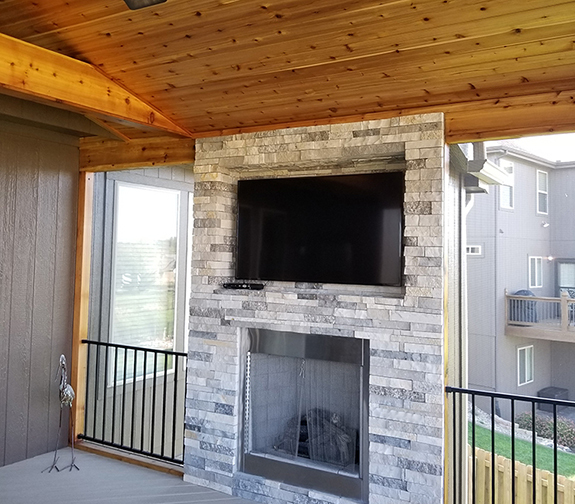 Can you mount an outdoor television above your outdoor fireplace? Can an outdoor fireplace be added to a space that is already built? This is a very popular question. It’s not easy picking whether you should have wood-burning or a gas-burning outdoor fireplace. They both have tremendous benefits. There’s nothing like a wood burning fire – the crackle, the smell, the magic. But, it’s also messy and the tall chimney required for a wood burning fireplace is much more expensive. Read below for more about this topic. You’ll spend a lot of time admiring the view of your outdoor fireplace and your furniture will be situated around it. Many customers have us “mount a TV” atop their outdoor fireplace. While it might be possible, it’s not recommended. An outdoor fireplace is very heavy and requires a different and much more substantial substructure to support it. If you already have an outdoor room and you’d like to add a fireplace, the cost would be quite prohibitive. It’s best to add an outdoor fireplace at the same time you add your new outdoor living space. The spacious porch below features a gable roof, a finished ceiling, and large screened areas for plenty of light and fresh air. The centerpiece of the roof is the outdoor fireplace with TV mounted above. This fireplace facade is also finished with stone. Try to imagine how different this screened porch would be without the fireplace as a focal point. 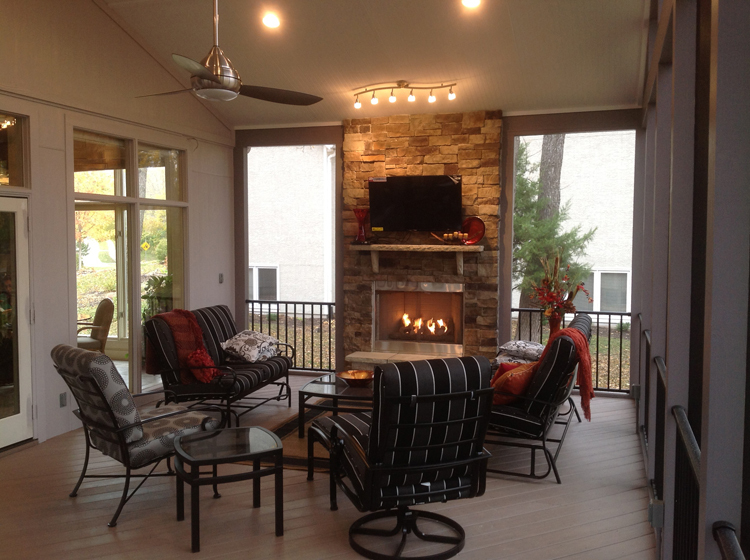 The Olathe outdoor fireplace you see below integrates beautifully into the screened porch. This fireplace features a stone facade but your custom outdoor fireplace will have the facade you select. The porch below has a bright and airy feel so the light-colored stone facade is a perfect fit for this screened porch. Gas, wood burning or electric? Gas is one of the most popular options for outdoor fireplaces. It has some practical advantages over wood burning. You won’t have any ash or sparks. You don’t have to collect wood and you don’t need to wait for the fire to go out at night. A gas fire throws heat and is enjoyable to watch. For this type of fireplace, we integrate a gas ventless firebox into your fireplace structure. Wood fireplaces are more traditional but they require a working chimney, wood storage, cleaning, and other challenges that you don’t have with a gas fireplace. One final option is an electric firebox. This will provide a semblance of the look. It is simpler and less expensive but doesn’t give the full ambiance and also will produce very little heat. 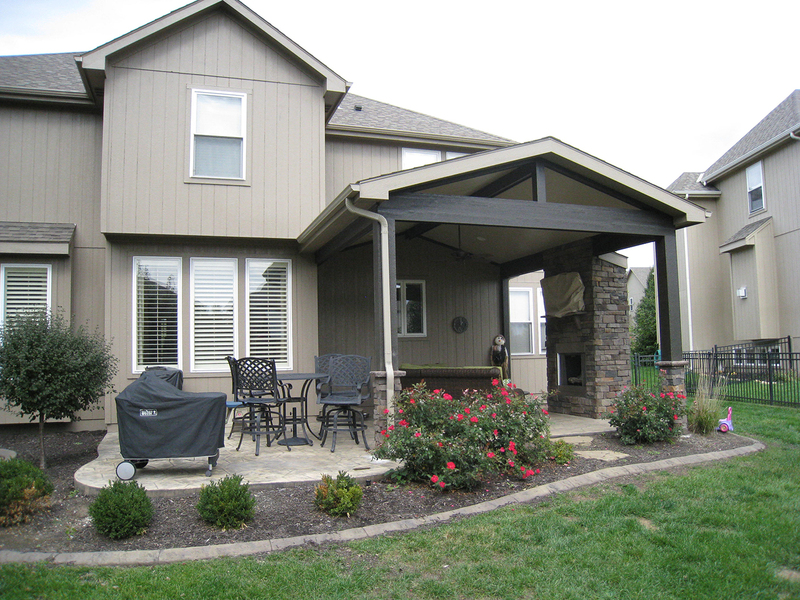 Leawood KS screened porch with outdoor fireplace! From the holiday decorations in the picture below, you can see that an outdoor fireplace can turn your porch into a nearly all-season room. This porch has a gable roof with a finished interior ceiling. Notice how the slender dark railings draw your eye out into the yard creating the perfect space to be one with nature while still enjoying creature comforts. Take a look below. It may not be readily apparent but this outdoor fireplace is strategically placed to provide privacy in just the right spot. Perhaps there is a particular view that would best be covered for privacy. That might be the ideal spot for your outdoor fireplace. Notice the creative half kneewall and half railing wall. This ensures all local building codes are met while still utilizing the half railing wall for more open space. 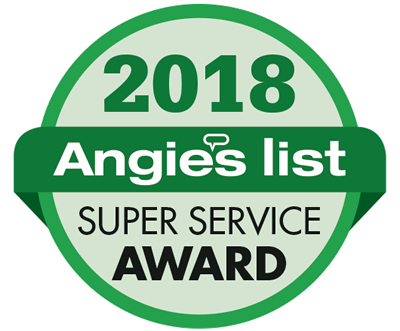 Angie’s List Super Service Award for ELEVEN years — 2007, 2009, 2010, 2011, 2012, 2013, 2014, 2015, 2016, 2017 AND 2018! Read our reviews! There are many considerations when building an outdoor fireplace. These include which outdoor area it will be a part of, how it will be powered, what type of facade it will have, whether there will be any built ins or anything mounted atop and other questions. Like any significant home addition, you want to select a contractor that can walk you through all of the key design considerations and functional considerations. It’s important to work with a contractor who has extensive experience with building outdoor fireplaces because of the complexity. 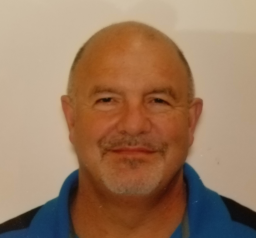 You also want to work with a reputable builder that’s going to ensure your project is inspected at the correct times to ensure it meets fire codes and building codes. Your porch fireplace can either be in a screened porch or within an open porch as you see above. Although an open air porch will not hold heat the way an enclosed screened porch will, it provides the same ambiance. The ceiling fan helps to move air throughout this porch. You’ll note from the picture above that we mounted a television above the fireplace for additional viewing enjoyment. There’s no doubt that a fireplace has an undeniable charm and appeal. 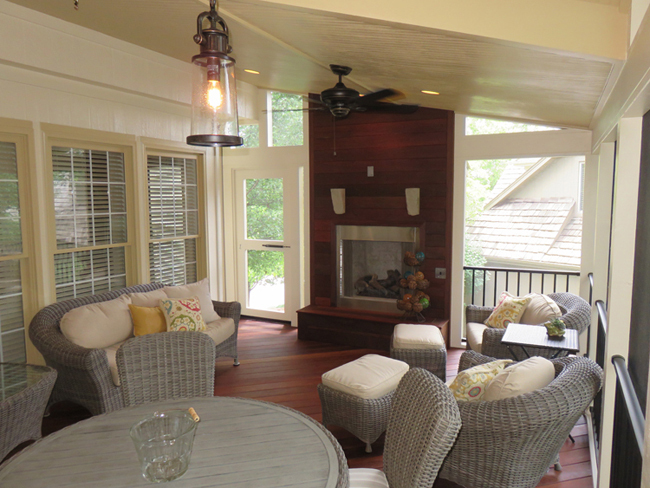 Try to imagine the above porch without the focal fireplace. Take a look through any magazine and you’ll see many beautiful images of fireplaces with stone facades. Stone is one of the most requested facade finishes. There are a couple stone options available. Cultured stacked stone is quite popular but you can also utilize natural stone and vary the aesthetic with different stone patterns. The porch you see directly below has an outdoor fireplace integrated into a porch with a unique custom roof design. The roof has a notched gable which not only adds light but it also adds aesthetic appeal and visual interest. Wood is another facade option. Below you’ll see a facade made of Ipe Brazilian hardwood. There are many design options for outdoor fireplace facades when it comes to stone. Designs can be rustic inspired, traditional, or even minimalist inspired. What’s your ideal stone fireplace design? The beauty in having and outdoor fireplace is in the beauty they provide, alongside the function of allowing you additional hours in cool weather in your favorite outdoor living area. Take a look at some of these for inspiration.